Most travelers to the Czech Republic visit Prague, and then they don’t end up going anywhere else. That’s a shame because the rest of the country has some beautiful places that are worth seeing. South Bohemia is a lovely area of the country, and it’s easily accessed from Prague. Tábor in particular is a gem of a small town. The hilltop town has a rich history, as well as a surprisingly robust cultural scene for its size. 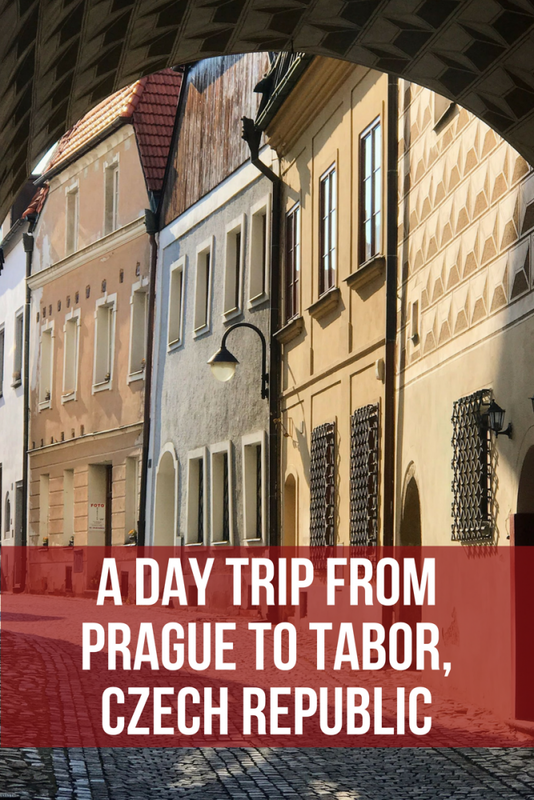 Tábor makes for a nice day trip from Prague, or even an overnight visit if you have the time. Trains from Prague to Tábor on CD take about an hour and 15 minutes, and run every half-hour or hour throughout the day. Buses from Regiojet take just slightly longer. 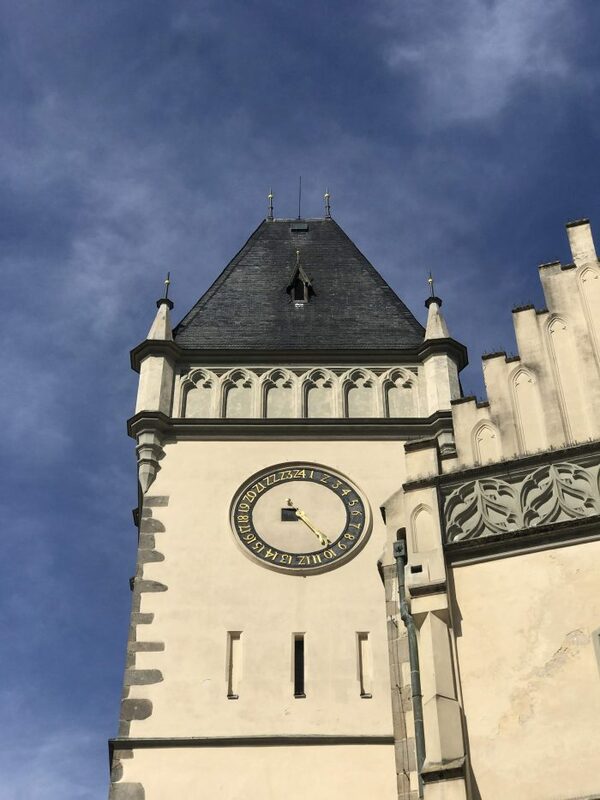 The short travel time means you have plenty of time to explore Tábor, whether you are visiting just on a day trip from Prague or on an overnight trip. I had the opportunity to visit overnight as a guest of the Tourism Authority of South Bohemia & Visit Czech Republic following TBEX Ostrava. There are several hotels conveniently located near the central Žižka Square in Tábor, including Penzion THIR, Pension ALFA, and Hotel Nautilus. Tábor’s unique history is at the heart of its attractiveness. The town was founded in 1420 on the top of a hill by Radical Hussites eventually known as Taborites. The Taborites & Hussites were separatists from the medieval Catholic Church, predating the Protestant reformation by about a century. The conflict between the Taborites & the Catholic Church meant that the town needed to be well-defended. Today, this defensive necessity is visible both above ground and below. The hilltop center of Tábor has narrow winding streets, making entry difficult. On the western edge sits Kotnov Tower and Bechyně Gate. To the north and south, there are overlooks with views across the South Bohemian landscape. To the east, the newer areas of Tábor stretch toward the railway station. In between, central Tábor is not large, but its meandering layout allows you to find quiet spots to take in a place where life moves a bit more slowly than in the capital. Despite its small size, Tábor is still filled with plenty of shops, restaurants, and other places to visit. Žižka Square is the beating heart of Tábor. Here you will find many of the town’s most important historical sites, as well as its most popular restaurants & bars. Be sure to allow time to take in the varied architecture surrounding the square, including the Town Hall. The restaurants & bars on the square all have huge patios, making them perfect places to relax on a summer evening. 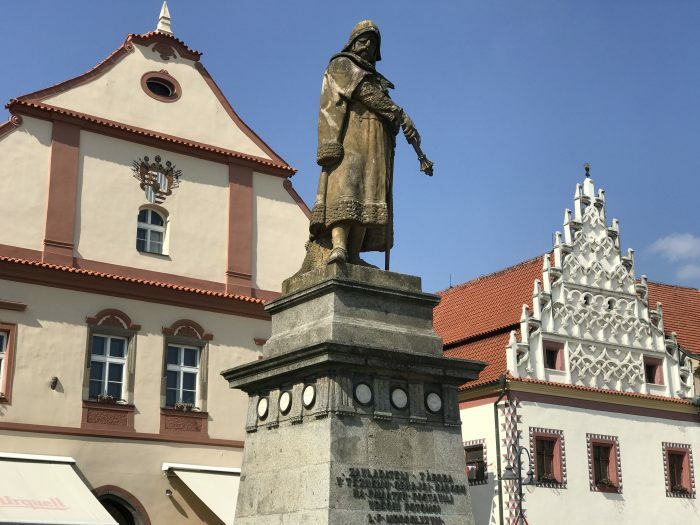 There is also a Monument to Hussite leader Jan Žižka of Trocnov, who helped build & defend the town in the 1420s. 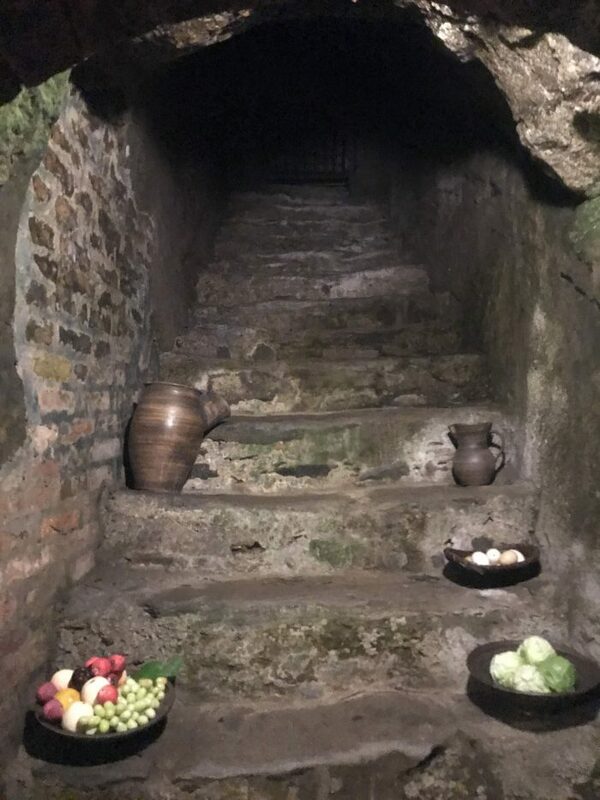 The other way that Tábor’s unique history manifests itself is in the underground tunnels that snake below the town. 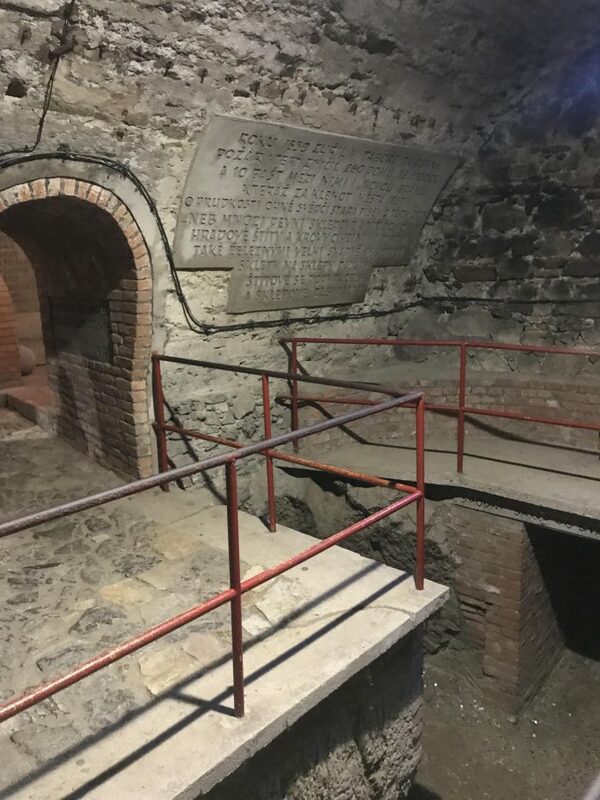 When Tábor was built, a labyrinth of passages was built beneath the city in order to store food & beer. The tunnels also served to house citizens & ease transport during times of battle. Nowadays, visitors to Tábor can still explore part of this system on a guided tour. 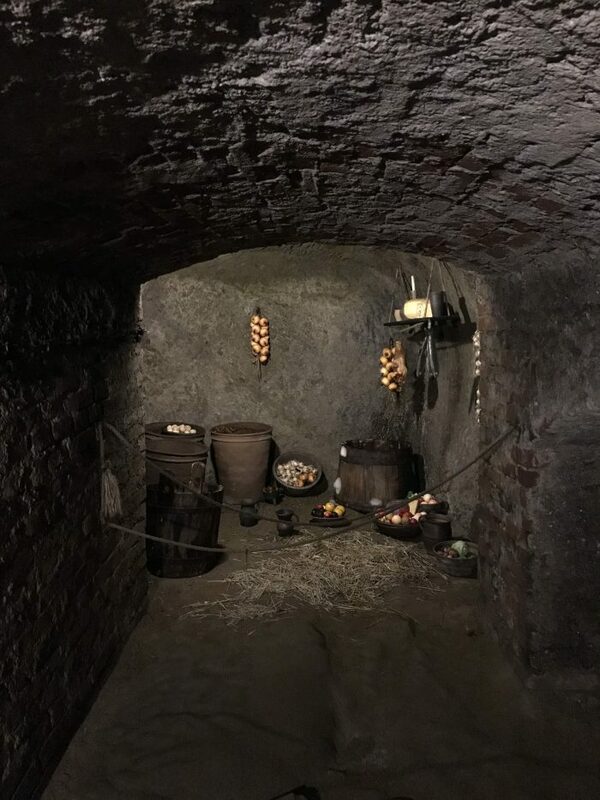 The tours start from the Hussite Museum and then wind their way underground beneath central Tábor, eventually popping back to the surface on the opposite side of the town square, some 500 meters away. The tunnels have low ceilings, so watch your head (unless you’re fortunate enough to be short enough for that not to matter). Hard hats are provided for those who want to take extra care to protect themselves. The floor can also be slippery, so watch your step as well. The best views of Tábor are from the top of the Dean’s Church of Lord‘s Conversion on Mount Tábor, located right next to Žižka Square. Even if you don’t make it to the top of the tower, this area of Tábor is still filled with pretty architecture. 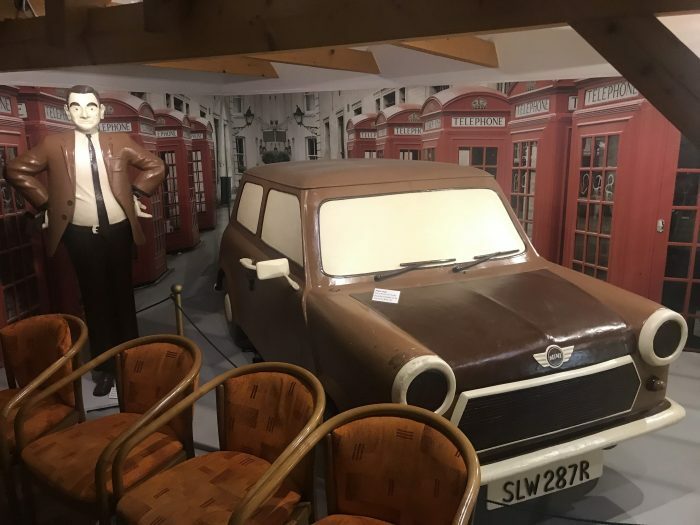 The Museum of Chocolate & Marzipan not only covers the history of chocolate & marzipan, it also ties them to the town itself. Inside, you’ll find a variety of delightful creations made from the two sweets. 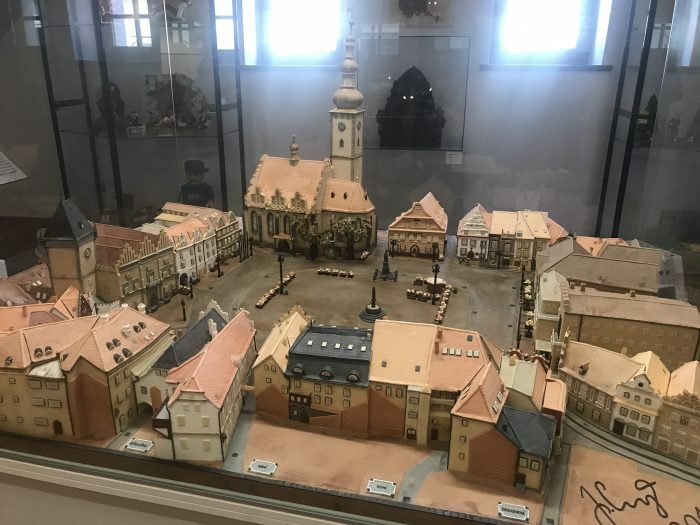 The highlight is a model of the town. The detail is stunning. There are marzipan fairy tales as well, along with other pop culture references such as Mr. Bean. 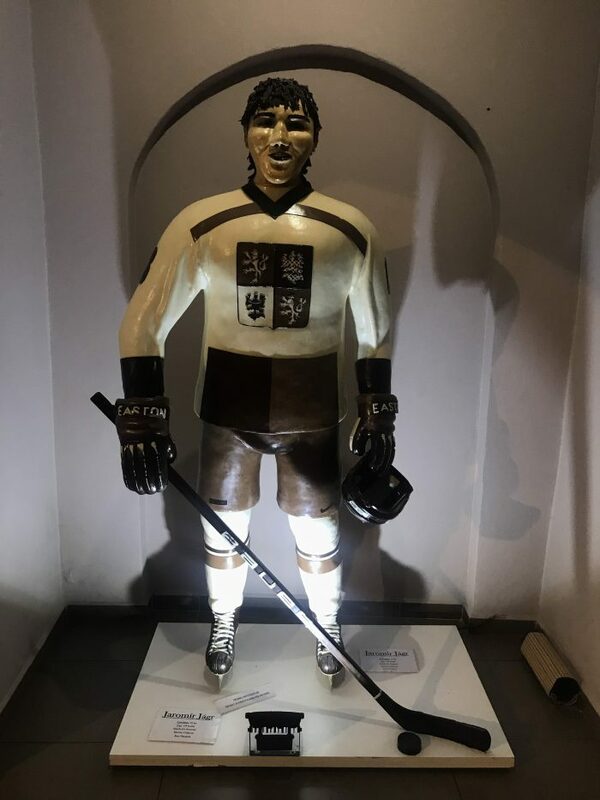 Czech hockey hero Jaromir Jagr also makes an appearance in life-sized chocolate form. 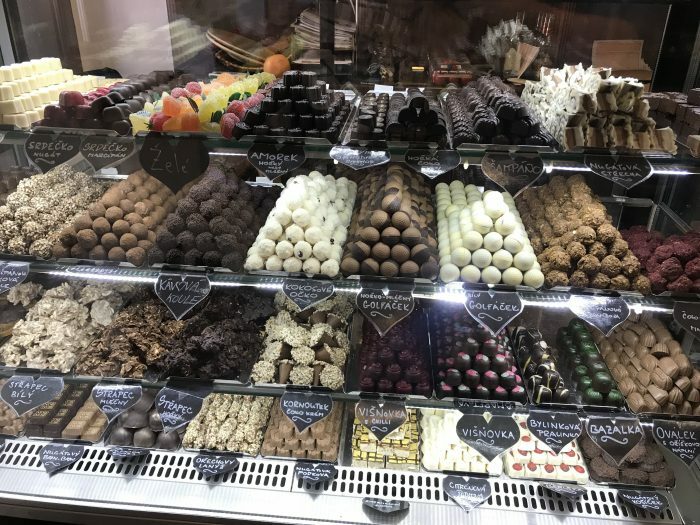 There is also, of course, a tasting room where you can purchase a variety of chocolates as well as several flavors of hot chocolate. If you’re lucky, you can even spot their in-house chocolate sculpting expert at work. When I visited, the tasting room was abuzz once people spotted him on the other side of the glass. The drool on the floor of the museum is not just for the chocolate. 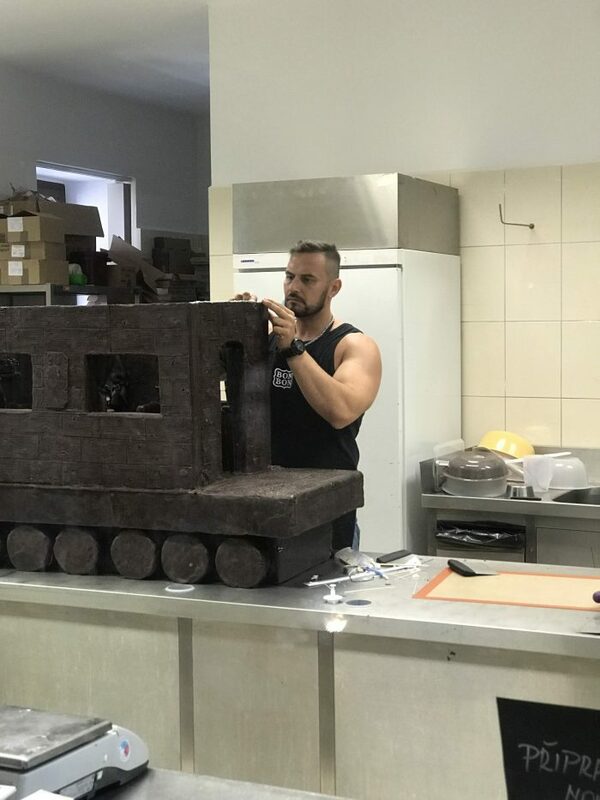 It’s unfair that not only does he attract this much attention for his good looks, but that he also spends his day working with chocolate. For some reason, travel blogging does not draw nearly as much attention from the ladies. 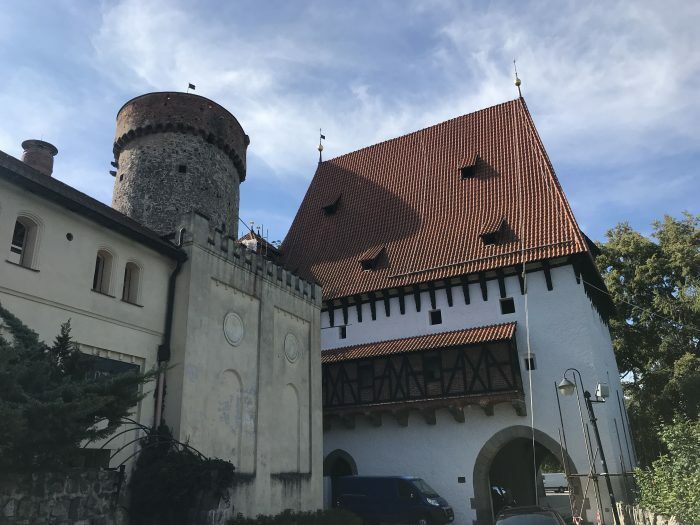 Tábor’s newest attraction is the Tábor Beer Museum. 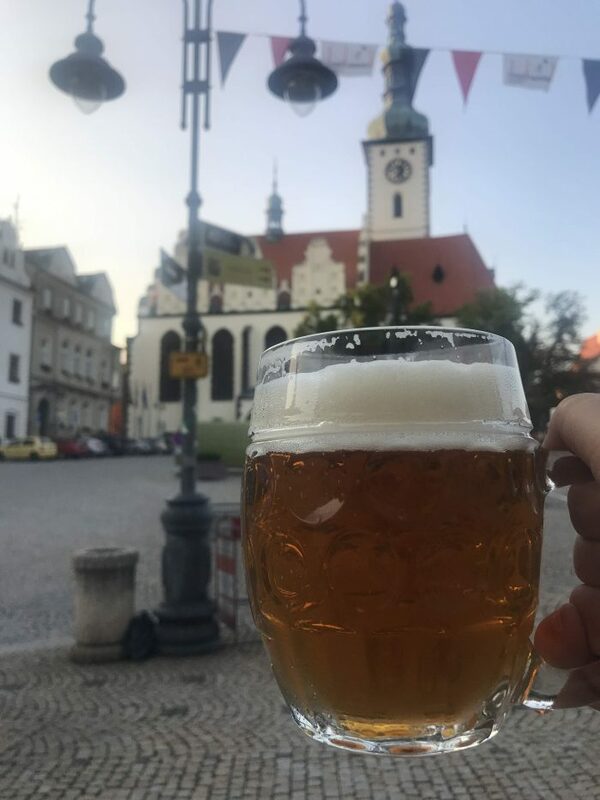 As with most places in Czechia, beer has historically been important to Tábor. However, the town’s last brewery closed in 1980. The new Tábor Beer Museum is rectifying this tragic mistake. In addition to telling the history of beer in the area, the museum also has a small microbrewery on-site. 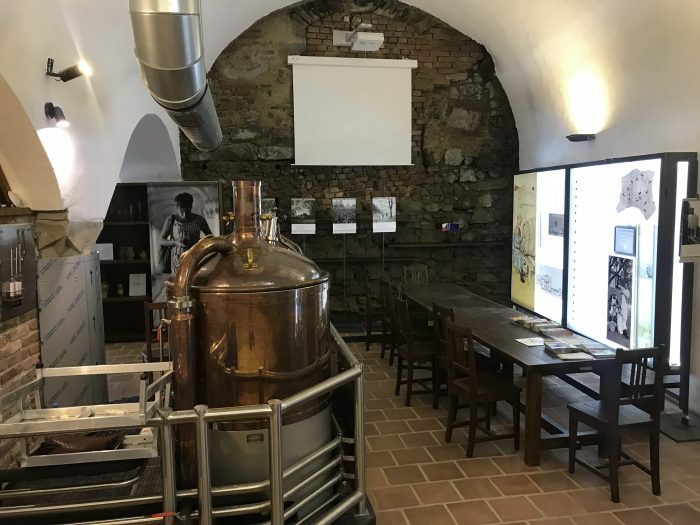 Visitors to the museum can have a pint of beer while learning more about the history of Tábor. In addition to the chocolate & beer museums, there are several other notable restaurants & bars in Tábor. Restaurant Goldie at Hotel Nautilus is not only one of the best restaurants in South Bohemia, it’s one of the best in the entire Czech Republic. Chef Martin Svatek is an expert in Czech cuisine, and he is a member of the Czech National Association of Cooks and Pastry Cooks team. His philosophy is “Return to the Nature, Respect to our Health and a Freedom of Thoughts”. 90% of the ingredients used at Goldie come from within 30 kilometers of Tábor. 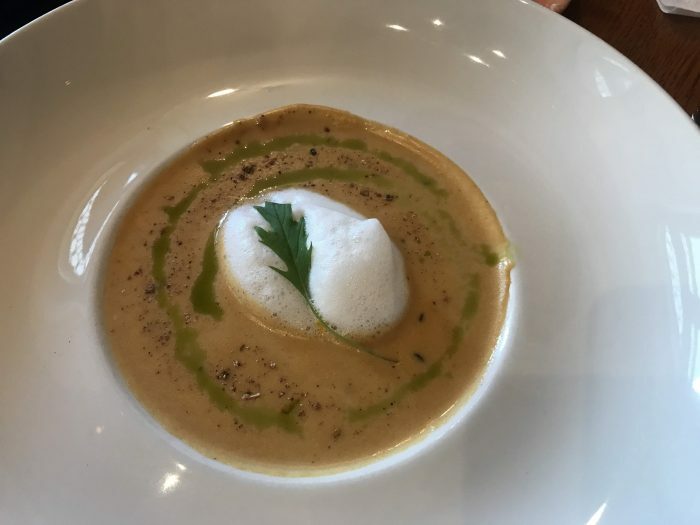 This attention to detail & use of local ingredients has led Goldie to be awarded best non-Prague restaurant. 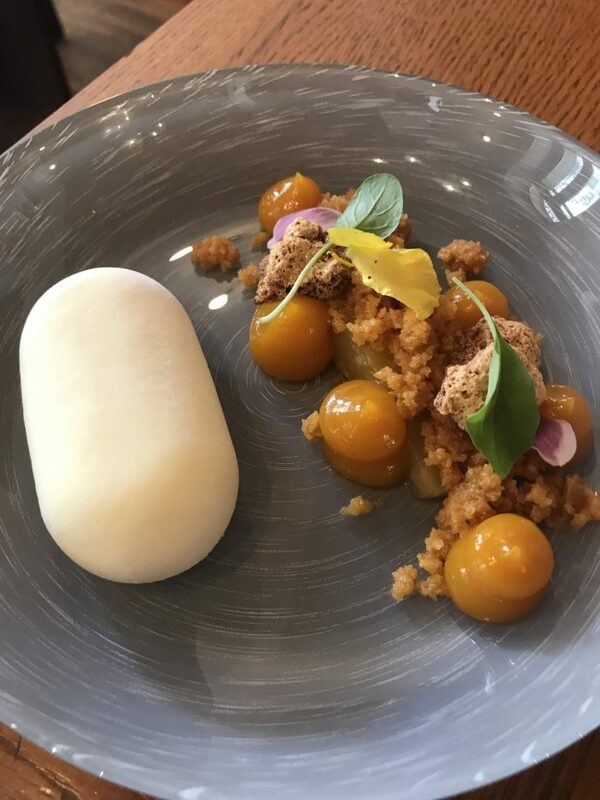 When I visited, I had the mushroom soup, a pork chop, and frozen panna cotta with pineapple. Everything was delicious. Výčep specializes in two things: beer & meat. 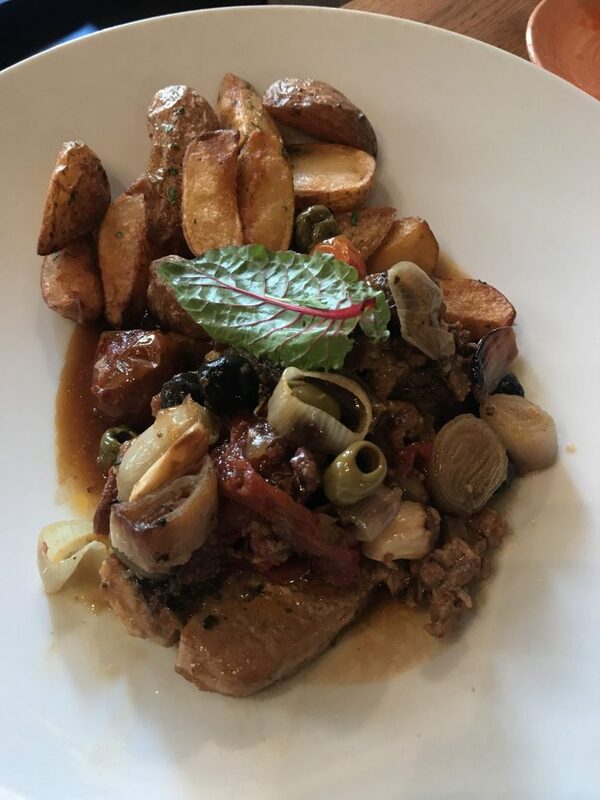 Located on the town square, the restaurant spills across the patio on warm summer nights. If it gets chilly, there are blankets available to keep warm. The beer comes from Pivovar Obora, which is located about 10 kilometers away. The brewery uses their own local hops to make a handful of beers that tend to be on the lighter side. 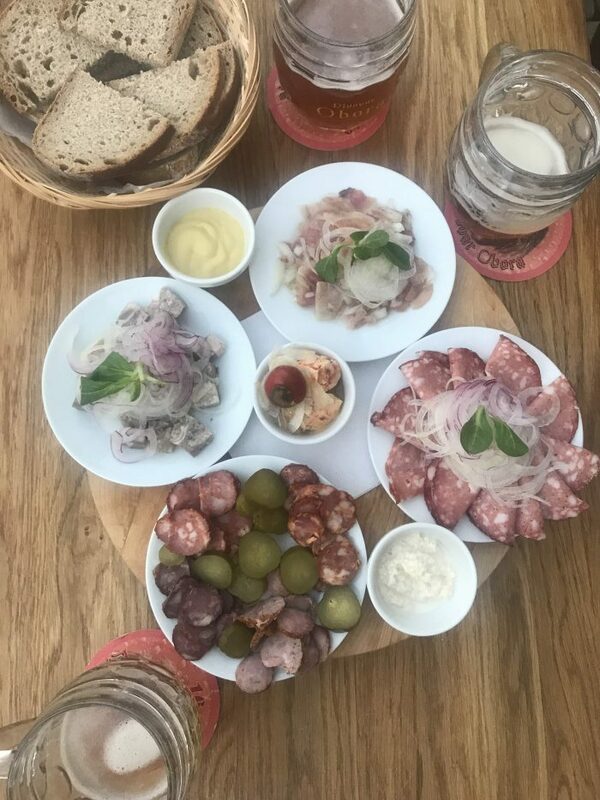 In addition to the beer, Výčep offers local charcuterie plates. It’s a perfect pairing. Thir Wine Bar is located in Pension Thir. 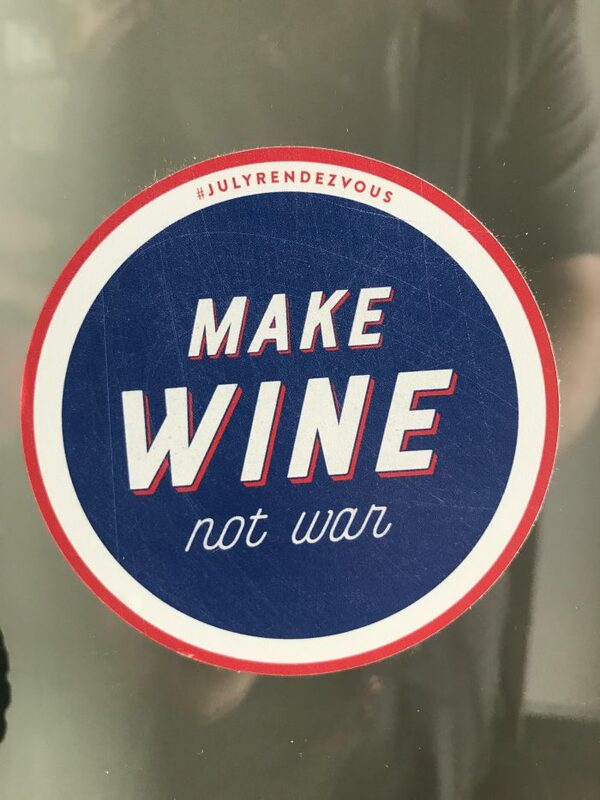 They showcase natural, organic, & biodynamic wines from Central Europe, along with food prepared using local ingredients. If you’re looking for craft beer in Tábor, look no further than Táborská pivotéka Craft Beer. They offer a wide selection of local craft beer as well as homebrewing supplies. Tábor is a lovely little town. There are enough activities to fill a full day trip to Tábor or even a few days if you want to take things more slowly. 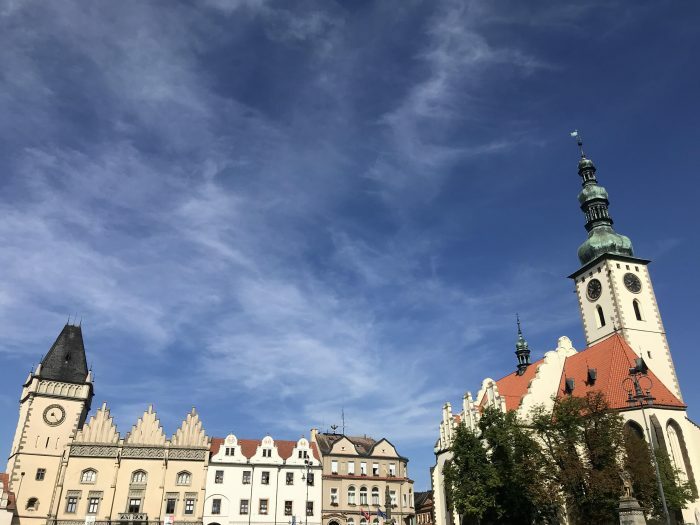 Whether you’re looking to keep busy with history & culture or have a relaxing time away from the chaos of Prague, Tábor is a town that is not to be missed. Note: I visited Tábor as a guest of the Tourism Authority of South Bohemia & Visit Czech Republic. All opinions are 100% my own.